Both fun and educational with our new personalized Name & A.B.C. Puzzle. 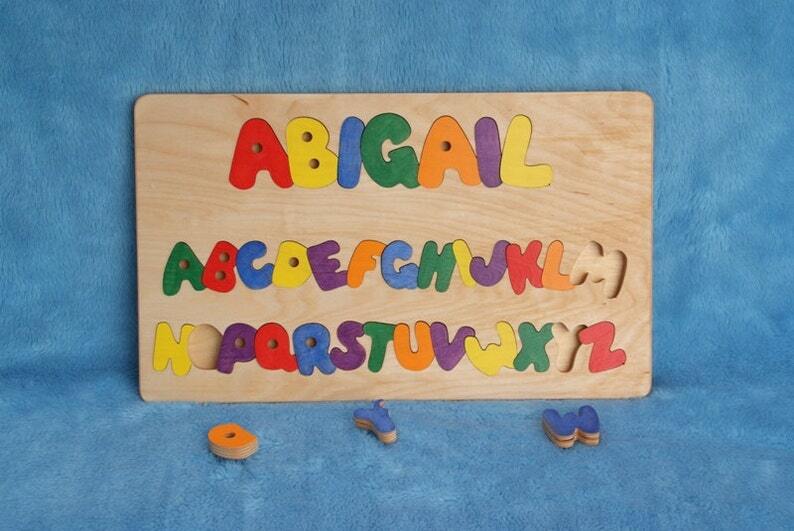 A perfect tool to help teach children to spell their name and learn their ABC's, also aids and promotes manual dexterity! Rounded edges & corners. 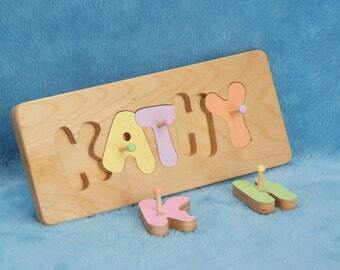 Sturdy, handcrafted construction and sanded to a smooth finish with a child safe finish finish. Name / A.B.C Puzzle holds any name, up to 12 Letters, and measures 11 1/2"W x 18 1/2"L.
Please indicatet the name that you would like on the puzzle & the colors that you want the letters, Pastel or Primary when placing your order. NOTE:The pegs make it easier to get the puzzle pieces out. shipped fast. great quality. birthday girl loved it! Amazing craftsmanship, friendly, kind, and speedy delivery. This is my go to baby shower and first birthday gift. Loved the puzzle, I bought this for my daughter's birthday and she loved it!